Tech Safari 2018: Visiting Google with Dean Starr. Computer Science (CS) at AU is on a roll, organizing exciting events, starting a master’s program, and hiring new faculty who are engaging in impactful projects. Over spring break, some of the department’s top undergraduates took part in the second annual Tech Safari. The Tech Safari is a program, spearheaded by CS alum John Morada, which brings students to California to meet with Silicon Valley CEOs, executives, and technical employees. 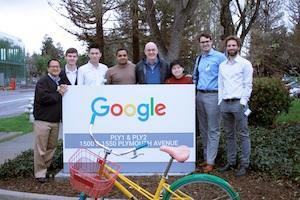 The students (and faculty/staff organizer Kristof Aldenderfer) visited the campuses of some of the Valley’s major tech companies, including Facebook and Google. In early fall, the department hosted the Optical Society of America’s Fall Vision Meeting. The meeting brought more than 120 top Vision Science Researchers to AU’s campus to discuss recent advances in physical, biological, computational, and graphical aspects of the visual world. The event was organized by AU Professors Bei Xiao and Arthur Shapiro. Data Science led by Professors Mohammad Mehdi Owrang-Ojaboni and Nathalie Japkowicz. Owrang’s current research interests include database modeling, intelligent databases, automatic knowledge acquisitions, knowledge discovery in medical databases, and developing a breast cancer prognostic system. Japkowicz focuses on machine learning in cybersecurity and other problems of defense and security. Her specific interests are in the areas of anomaly detection, the class imbalance problem, learning from data streams, and lifelong learning systems. Games and Computational Media led by Professors Mike Treanor, Arthur Shapiro, and Bei Xiao. Treanor’s research is broadly aimed at finding new approaches for interpretation and expression within videogames and computational media. His scholarship is primarily about videogame interpretation, tools for game creation, social simulation, and procedural content generation. Shapiro directs the laboratory for the Study of Perception, Reality and Illusion (SPRI) and is the editor of The Oxford Compendium of Visual Illusions. His research investigates computational aspects of vision and how computational media (such as virtual reality) can be used to create visual illusions and other misperceptions. He is interested broadly in tools that can be used for perceptual augmentation, assessment, and in camouflage, concealment, and disguise. Xiao seeks to understand how perception is used in action in natural tasks (e.g. how visual material perception is used in motor planning during object manipulation). In addition, she breaks the boundary of psychology and computer science by developing algorithms for artificial systems to do similar tasks as humans, and by simulating virtual scenes that appear real. She uses a combination of human psychophysics, computer vision, computer graphics, haptic device, and VR techniques. The Computer Science Department was successful in hiring three highly regarded new faculty members who will be joining the department from fall 2018 through fall 2019. These are Professors Alex Godwin, Chun-Hsi Huang, and Mark Nelson. They will contribute to the data science and games and computational media clusters. Godwin’s research focuses on using information visualization and novel interaction techniques to make civic data more accessible. He seeks to answer questions such as: How can we evaluate the effectiveness of policing in a community, or identify the cause of large differences between the official records of crime and undocumented cases? How can we utilize social media data to understand the changes in public sentiment as a result of major events? Huang’s interests lie in the areas of extreme-scale computing and data analytics, computational biology and life-science informatics, as well as combinatorial algorithms and experimental algorithmics. In the area of computational biology, he seeks solutions to problems such as finding transcription factor binding sites in DNA sequences (aka motif search). On the data science side, he looks at the application of parallel and high-performance computing to explore extreme-scale data analytics. Nelson’s research incorporates methods from logical theorem proving, constraint solving, machine learning, and computational creativity in order to empower people to co-create and solve problems in collaboration with AI systems, especially in the domain of videogames and other forms of interactive digital entertainment. The particular question he is currently working on is: How can people be empowered to make games on smartphones and tablets rather than only playing them? The Department of Computer Science has recently engaged in a number of impactful projects. Shapiro co-edited The Oxford Compendium of Visual Illusions (Oxford University Press, 2017). The book received the 2018 Association of American Publishers’ PROSE award for Best Single Volume Reference in Science. Working with PhD student Wenyan Bi from psychology and several undergraduate students, Xiao led the team that recently developed a novel experimental paradigm that investigated how humans perceive material properties with natural tasks using VR, game engine, tactile device, and real-time computer graphics. The Xiao lab just published a journal article that developed a computer vision algorithm that can automatically estimate material properties of cloth from videos as well as humans do. Sponsored by ETS, Professor Treanor developed games that teach and measure the cross cultural competency and meta-cognitive abilities of players. Additionally, he is currently developing an experimental game that uniquely integrates novel social simulation technology into a role playing game, as well as an artificial intelligence tool that generates arcade games about provided subject matter. In a publication that will appear later this year in IEEE Intelligent Systems, Nathalie Japkowicz, former PhD student Adrian Taylor (U Ottawa) and colleague Sylvain Leblanc (Royal Military College of Canada) discuss their research on detecting devastating cyberattacks on the computer network of passenger cars. Together with senior James Clark and visiting scholar Zhen Liu, Japkowicz seeks to expand her research to longer-term situations where the learning system would automatically detect changes of contexts and adapt to such changes. Owrang is currently collaborating with a microbiologist, pharmacologist, and oncologist from Howard University Cancer Center in Washington, DC, to define the prognostic factors affecting the survivability of the Triple Negative Breast Cancer (TNBC) patients.